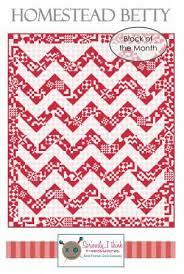 Sweet Stitches is pleased to announce our next Block of the Month, "Homestead Betty". A Sweet Little Red & White Pieced Quilt made in the Maywood Studio Fabric line “The Little Things”. The quilt was assembled by Linda Poparad and was quilted by Judy Holden. The Quilt will hang in the shop soon. We are planning a February 2019 start with sign-ups in January. This is a beautiful quilt and fabric line that will be a great project for the upcoming year.